Thanks for all the great suggestions you readers have sent in to help with my burplessness issues! There were actually quite a few tips in the comments of the previous strip that I hadn’t heard before, so I’ve been methodically trying each one – so far to no avail – but hope remains strong. 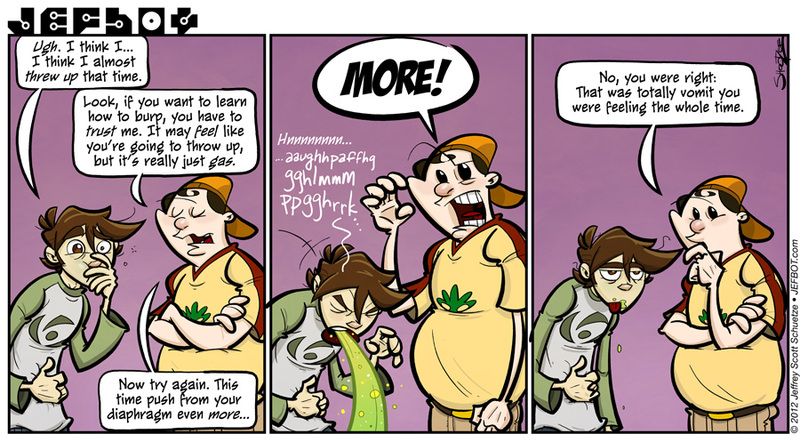 However, as can be inferred from today’s comic strip, many of the suggestions have brought me to the brink of vomiting; I’m actually surprised I haven’t seen this as a side effect when people belch! Should I learn to burp, I’m afraid that spontaneous, projectile vomiting will occur, which gives me pause as to whether or not the entire practice is worth pursuing. A heads up that there probably won’t be a new strip this Friday as I’m heading to Phoenix, AZ on Wednesday for the Phoenix ComiCon! Come on down if you’re in the neighborhood and say hey! (And to get your free BOTton for JEFbot readers only.) Details in the JEFblog, here. Sweet! Staying up paid off for once! 🙂 I’ll tell you right now often it’s the burping that KEEPS me from throwing up. So I’d keep trying if I were you. But as long as you have the reflex to be able to throw up, it shouldn’t be a fatal flaw. Though all those Seagulls my class mates killed in Middle School by throwing them food with a Alka-seltzer in it may disagree. I’ve never heard of someone’s inability to burp until I saw your strip. Never really thought it would be an issue, but now that I think of it, not being able to burp could pose an issue with fizzy drinks. Maybe you could try croaking like a frog as a starting point. At least to get the basic vibration going down your throat. i’ve only met a couple people with the same problem, Saeed, and one of them said he cured himself by forcing himself to throw up until he would burp, and the other had an operation to fix it. both are solutions i’d rather avoid. i’ll try the croaking! anything’s worth a try. You know, vomiting on cue could come in useful, professionally. You can do voice-over work without risking a string of dreaded burp-takes after lunch. Plus, it’s a talent that not many actors have, without the kind of destructive prep that could adversely affect their performance. Kind of an interesting niche—and it’s not the weirdest thing I’ve seen on a CV. So maybe it’s kind of a silver stomach lining? Yeah, the vomit/belch is very disgusting. Maybe you should be thankful you can’t burp. i fluctuate between “thankful” and “green with envy,” TPC. I love how the Cornfather just takes the barfing totally in stride. He must have a stomach of steel. at least you’re able to know when it’s going to happen and put a stop to it, TCG! heheh. sorry, Pixie. i guess starting your day with an unexpected vomit joke isn’t all that pleasant. and, yes! in my younger, “drinkier” days, i’m sure i could’ve avoided some barfing episodes had i been able to burp! Im going to guess and hope this didnt happen in real-life. Your effect of vomit is actually amusing for me. Because it makes me thirsty for Mountain Dew. Did you like Re-Animator? What’s it like? The only zombie movie I’ve seen is Zombieland, which is quite the badass comedy. Re-Animator: The Musical was great! it was very bloody and gross, but the performances and songs were good and i’d recommend seeing it if it comes to your town. just don’t sit in the first three rows if you want to remain blood-free. Gross! And sweet at the same time! I don’t really understand why some people can’t burp. I don’t know anyone, not even any girl, who can’t burp. Consider it as a super power. When will jefbot meet cel again? It seems like everything is only half as funny from the usual without jefbot being weird around her… no offence. i haven’t met many people who can’t burp either, DAS. i think i’ve only met like, 3 or 4 people in my entire lifetime. i do hope it comes in handy as a superpower, later. otherwise, i’m just in burpless limbo for nothing! and, yes: cel will be back soon! GROOOOOOOOOOSSSSS! Now I am sick to my stomach! sorry, Nathan. if you’re sick to your stomach, maybe barfing will help? Panel two is laugh out loud hilarious! I love the expression in The Cornfather’s eyes. LOL. You had me scared there for a moment that your strip was based on real life from my suggestions. Still, vomiting *shouldn’t* happen if you’re not “pushing” anything out, but just releasing the pressure, so maybe it’s just your fear of vomiting that’s holding you back from burping? it is somewhat based on real life, HiEv! i’ve definitely been in this situation when i’ve tried to make myself burp. and i’ve been giving your suggestions a try every so often since you posted ’em! been trying not to force anything, but just “releasing the pressure” doesn’t seem to be taking effect! and i do live in california, so an epic burp might just make the west coast fall into the ocean. i’ll feel bad. 3. eating really fast. drinking fast should also do the same. also, if you start to feel pressure in your stomach, try massaging the area, standing up, and if you feel brave, try light cardio. it should just come out naturally. Whats weird is ive actually developed the skill to pretty much belch on command. theyre pathetic, but its still there. hmmm… i’ll give this a try, steve. of course, if it doesn’t make me belch, i’ll be in pain for at least an hour or two! maybe you should stop taking Mentos with your Mountain Dew to help you burp? i shudder to think what would happen if i did that, Oz! Seeing as all burping is is the stomach getting rid of uneeded air bubbles throwing up should do the job. Is it a reliable method? Heck no. Honestly though, if I chug a soda to fast then it feels like I’m going to throw up, at least until I burp. Come to think of it, what does happen to you if you chug a soda? Oh, wow. I feel sorry for you man. I know how that feels. I’ve had a few times were burping was followed by vomit, which is never fun. Also, one of your wallpapers popped up when I was doing a random image search today. yeah, “never fun” pretty much sums it up, Fijiman. ha! i feel ya, T: just talking about burping and vomiting gives me a lump at the back of my throat that i can’t do anything about! blerg. On a completely unrelated note, does anyone else want to see Cornfather go full-tilt dictatorial supervillain based off of panel 2 alone? I think the Sith side of Cornfather is returning. Wuahahahaha..
perhaps someday the Cornfather will become a supervillain, Joe! god knows he has it in him. heheh. thanks for the sympathy, DJ. Jeff!! D: Your vomits have always made me cringe a little. I don’t know if that should be a compliment because they look so believable or not..
i’ll take it as a compliment, Nat! It is bad that sometimes that the burps have the aftertaste of vomit. I will admit to that at some times. ewww. vomit-tasting burps!? sometimes i think maybe it’s better that i haven’t learned to belch, Bl4ckw0lf! ha ha ha ha! i like it! this is funnyiest comic ever i have read! I can’t imagine not being able to burp after drinking soda. It would be painful. I’m guessing you don’t consume a lot of carbonated beverages, Jeff? as long as i don’t chug a bunch of it, i’m fine, Stan. and i’m generally a really slooooow drinker, which helps. What’s really alarming is when you force a belch to get a painful air pocket out of your throat, and then you can’t stop burping. Starts feeling like you’re about to throw up, even though you usually don’t. One of these days you’ll burp and it’ll shatter a hole in space-time. i hope so, Infamous Nefarious. at least this “not being able to burp” thing will have been for science! Great meeting you at the AZComiCon, long time reader (I’m not sure how long though) and looking forward to the new storyline you mentioned. Hope you had a great con! hey, James, thanks for coming by the BOTbooth! i’m already missing Phoenix. P.S. Is it bad the the barf reminded me of slurm from futurama? heh. since bot’s vomit was comprised of regurgitated mtn. dew, i think “slurm” is apt, Kirtro! Awesome!!! I can burp. 7up makes me burp before I can pull the can away from my face.